Well, today is the day. I head back to school. It feels so weird to be a student again. I honestly don't know what to think about it. I haven't sat in a classroom for 3 years, and those 3 years have been LOOONG years. So much has changed. I'm not in that mindset yet. I am so used to having my nights free, and now two nights a week, I will be in a classroom. I am super stoked to be able to chase my dreams. I am actually really lucky that I made it into the program that I did. I wasn't supposed to be able to start the program until I was 3 years sober, yet here I am at 7 months sober. I am so excited to learn more about addiction and recovery. I feel that this experience will enhance my recovery journey and I will be able to give back in more ways than I already have. I really believe the best addiction counselors are addicts in recovery. It adds a layer of understanding and empathy. I have been able to teach a few groups at my old treatment center, and I love being able to be an example to the clients in there and show them what recovery really looks like. So...here we go. Off into the unknown. I am sure it will be a wild ride, but I am ready! This is my "I'm gonna kill it" face. Definitely appropriate for today. PS- I haven't thrown up in a week! The medication I am on seems to be working! Holla! 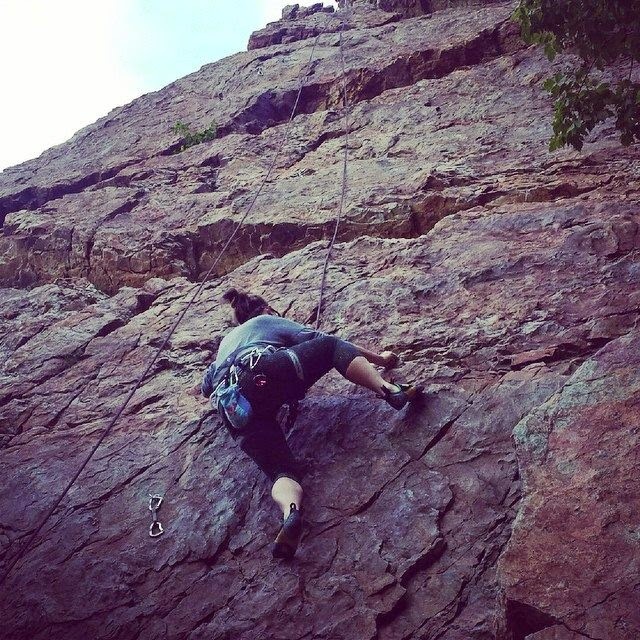 Last night, I went climbing with a couple friends who are also in recovery. I love being around friends who are in the same boat. There's just a level of authenticity that recovering addicts have that is hard to find. Happy Easter & A Day Outside!! !